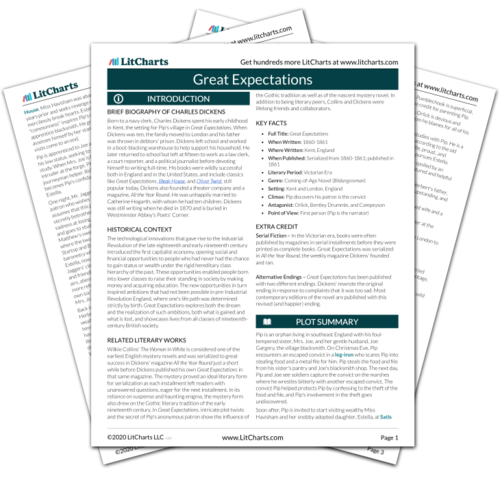 Instant downloads of all 946 LitChart PDFs (including Great Expectations). 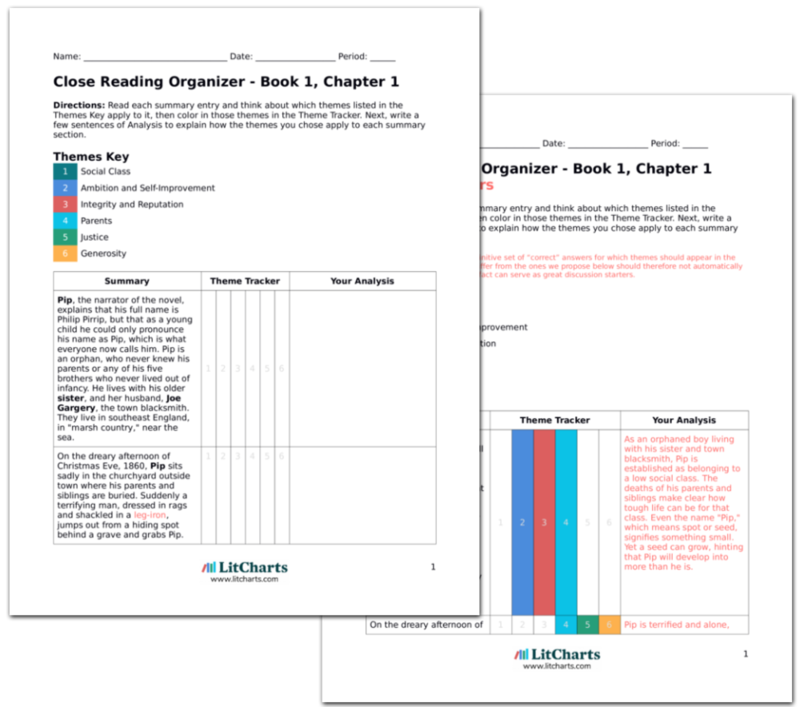 LitCharts assigns a color and icon to each theme in Great Expectations, which you can use to track the themes throughout the work. Pip runs out onto the marshes in the mist of Christmas dawn to meet the convict, terrified that he'll be caught and feeling as if every object appearing out of the mist is actually running towards him while he stands still. He compares the damp cold "riveted" to his feet with the iron "riveted" to the convict's leg. Pip's perspective is warped by guilt. Nevertheless, likening the marsh cold to Pip's leg iron raises questions about Pip's ties to this landscape: can he escape it? Can he rise up in the world and move beyond it? Flustered by fear, Pip accidentally runs in the wrong direction and instead of reaching the Battery where the convict awaits him, he stumbles across another convict who swears at Pip and tries to strike him, then stumbles off into the mist. Pip assumes this must be the young man the first convict threatened him with. Pip runs on and reaches the Battery, where he finds the convict freezing and limping. He gives the convict the food and stands in polite silence while the convict tears into it, wishing the convict a pleasant meal and silently observing that the convict eats like a ravenous dog. The convict thanks Pip sincerely. The convict's messy eating habits illustrate how desperate he is for food, but they also suggest he comes from a lower class background by showing he lacks higher class manners. Pip's sweet temper in saying that he hopes the convict is enjoying the food brings out the convict's softer side—generosity breeds generosity. Pip, afraid the convict may not leave enough food to satisfy the young man he thinks he just met on the marshes, shyly suggests that the convict shouldn't eat it all. The convict dismisses him. Then, when Pip insists he thought the young man looked hungry, the convict stops eating in surprise and asks Pip to describe the young man he saw further. Pip tries to describe that man's leg-iron without saying the word itself, thinking it might be offensive. He describes a bruise on the man's face, which sends the convict into an angry rampage, dropping his food and beginning to file furiously at his leg-iron. Pip slips off while the man keeps filing. The reader can tell that the convict would probably not be offended by Pip describing his leg-irons outright. Pip's sensitivity about doing so shows Pip's concern for the convict's own sense of dignity. Ross, Margaret. "Great Expectations Book 1, Chapter 3." LitCharts. LitCharts LLC, 16 Sep 2013. Web. 26 Feb 2019. Ross, Margaret. "Great Expectations Book 1, Chapter 3." LitCharts LLC, September 16, 2013. Retrieved February 26, 2019. https://www.litcharts.com/lit/great-expectations/book-1-chapter-3.